Looming over the sparkling Mirror Lake, Bald Mountain is one of the most recognizable peaks in Utah’s Uinta Mountain Range. A relatively short but spectacular hike will take you to the top of this 11,943 foot peak, providing some of the most commanding and majestic mountain views in the state! We love this hike for many reasons. This hike is not an all day commitment like most trails to the mountain tops. It can be completed in just a few short hours by even the average hiker. Although the elevation gain is challenging, it is not incredibly strenuous. The 360-degree views are astounding and well worth the climb! Hiking to the top of Bald Mountain feels like you are hiking to the top of the world. The treeless and bare mountainside provides a glimpse into life in the high wilderness. Breathing in the crisp air is rejuvenating. Looking out over the vast mountain range is elevating in every sense of the word. If you need a break from everyday life, this is the place to be. The signs at the trailhead can be a little daunting but serve as a reminder that hiking to the top of any mountain can be strenuous and dangerous. Be sure to give yourself plenty of time to complete the trail. At nearly 12,000 feet, your body will probably feel more exhausted than on other trails. Drink plenty of water and rest as needed. Because of the elevation and exposure of Bald Mountain, I highly suggest attempting this hike in the morning hours to avoid the high risk of afternoon thunderstorms. September is also a great time to trek to the summit! The Bald Mountain trail is accessed via the Mirror Lake Highway and a fee is required to use the trail. From the trailhead, stay right when the trail forks and begin hiking up the switchbacks on the south side of the mountain. For me, this trail is divided into three sections and the switchbacks are the first. This section is challenging because it is a lot of stair-stepping up the rocks (this wears my legs out faster) but the views are indescribably beautiful! Although the trail is steep and exposed, I never felt unsafe. After completing the switchbacks, you will be rewarded with a break. The second section of the trail cuts through Bald Mountain’s picturesque high tundra and is relatively flat. 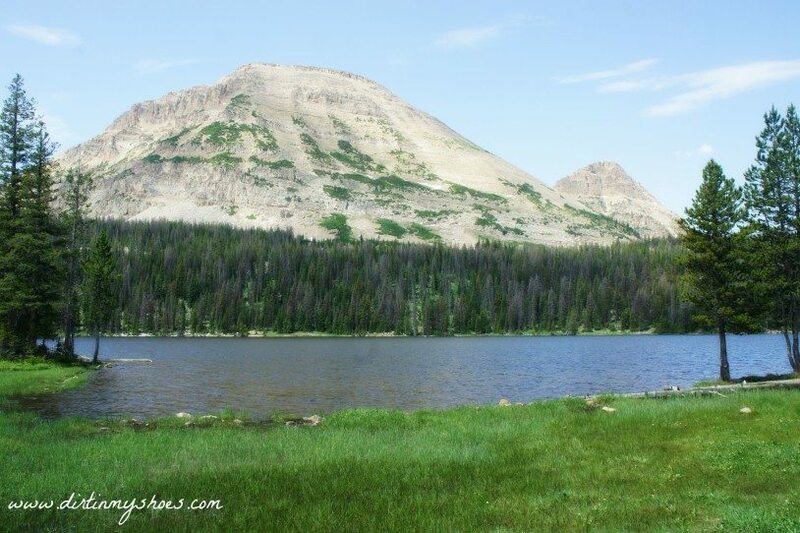 We could see at least a dozen lakes along the horizon and the views of the Uinta Range from the trail are incredible! Be on the lookout for mountain goats as you hike. We were lucky to see a whole family of goats napping on the cliffs below. Have you ever seen a mountain goat on the move? They jump from ledge to ledge with such grace and ease….it is phenomenal (and a little unnerving)! The third section of the trail is more stair-stepping to reach the summit. The anticipation of reaching the top, plus some breathtaking views of the surrounding mountains and lakes, made this part of the trail feel less strenuous to me than the switchbacks at the very beginning. This rock stairway feels like the stairway to the top of the world! Almost there! From here you can see Mirror Lake below and Hayden Peak in the distance. I suggest bringing a jacket or wind breaker for the summit and don’t forget to sunscreen up! The suns rays are powerful at this altitude. Take in the stunning 360-degree views from the top of the beautiful Bald Mountain! We found a nice rock to sit on and enjoy our surroundings while we ate our snacks and took lots of pictures. The top is wide and has plenty of room for a crowd of people to spread out and enjoy some solitude. This hike is 5 miles roundtrip and gains 1,250 feet of elevation. Because of the rock stairs and the high elevation, I would consider this trail to be moderately strenuous. I, personally, would not bring young children on this hike because of the steep cliff edges we encountered along the trail, but supervised older children who like to hike should be just fine. If you want to bring your furry friend, good news! Dogs are allowed on the Bald Mountain trail. If you are looking for a shorter and more family-friendly trail in the area, be sure to check out Ruth Lake! From Salt Lake City, take Interstate 80 East for approximately 30 miles until you reach Highway 40, exit 146. Head south on Highway 40 for about 3 miles before taking Exit 4 to Kamas/Park City. Turn left onto Highway 248 and follow the road for 12 miles. When you reach Main Street, take a left and drive two blocks until you reach Highway 150. Turn right onto Highway 150 and drive for approximately 30 miles to reach the Bald Mountain Trailhead on your left. The parking area is dirt and has space for about 30 cars. Pit toilets and picnic tables are also available here, but no trash service so be sure to bring a garbage bag to pack out your trash. Have you hiked to Bald Mountain or have any questions about the trail? I would love to hear from you in the comments below! It was very windy on the way up but virtually no wind on the summit joined by a tiger swallowtail butterfly. Is this normal the lack of wind? My hike was on July 17, 2017. It’s usually pretty windy up there, but sounds like you had a great time! !